A black and white negative of the Rowe family standing outside the contestants' entrance at the Whitby Festival on May 10, 1938. 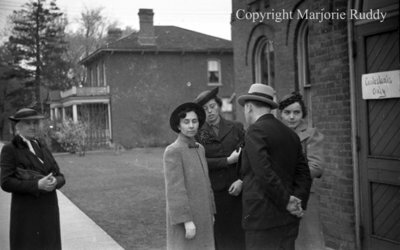 In this view from left to right: Mary Rowe, Kathleen Rowe, unidentified woman, unidentified man, and unidentified woman. Mary Rowe was born at Whitby on 12 February 1876 and died at Whitby on 18 March 1951. Mrs. Rowe is buried at Mount Lawn Cemetery, Whitby. The Rowe Family at the Whitby Festival, May 10, 1938, Marjorie Ruddy. Whitby Archives A2013_040_982A.